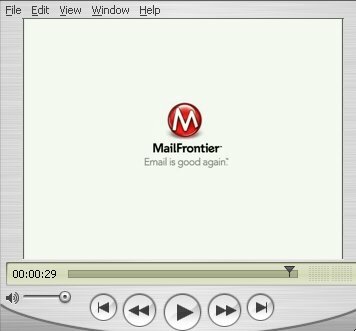 MailFrontier launched a new advertising campaign on 2/23/04, which included this TV ad, and also some print ads and billboards and tradeshows. To see a billboard advertisement click here. Click the fake image below to download and play the ".mp4" movie. Or click here to download and play it as a QuickTime ".mov" movie in a nonstandard format. To read articles about MailFrontier written in the popular press, click here.